In 2007, I began training Sky for Gundog Working Test trials. At her first 2 trials she came 3rd and 2nd. She gained her third pass with a first place and is now ready to move up to Open. However, at this time, there are no official ANKC titles. New rules commenced in 2011, and the RAT (Retrieving Ability Test) title was established. 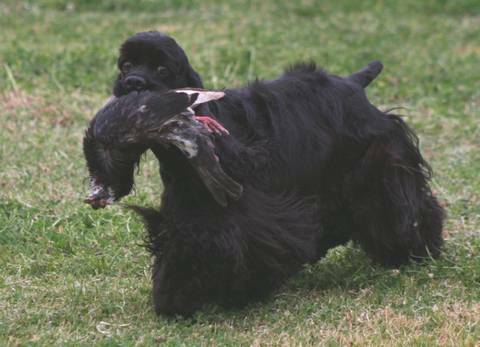 Sky has gained her novice title, being the first American Cocker Spaniel to achieve this new title. The Retrieving Ability Test is designed to test a gundog's basic retrieving ability. At Novice level, they are required to display some general obedience behaviours, and complete two retrieves using a dummy or bird. At Open level, they are required to complete 3 retrieves of greater difficulty. Sky LOVES displaying her Gundog abilities.